Jane Szelewicki, control systems specialist for the Physical Plant Utilities Office, collects water samples from the Isenberg School of Management's new air conditioning system. 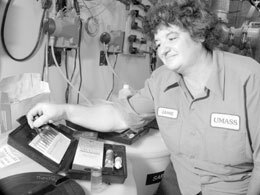 She bioscans the cooling system water of every building on campus for bacteria each week. Szelewicki invites anyone who would like to take a tour of the water treatment program to call her at 5-3454. For the past week I've tried to write dispassionately about the terrible budget cuts that are forcing the closure of the Chronicle, but after 17 years with the paper, I feel as if there's been a death in the family. An already grim budget situation took a turn for the worse June 13 as legislators approved a conference committee proposal that cuts funding for the University system by 18.5 percent or $80.5 million. Chancellor John V. Lombardi announced an additional $5.66 million in budget reductions in a June 24 memo to the campus. The reductions, paired with the $15.8 million in cuts Lombardi previously announced for a total of $21.5 million, put the campus just over half-way toward covering a $41 million gap in funding for fiscal year 2004. The Board of Trustees awarded tenure to 17 faculty on the Amherst campus at its May 7 meeting and approved an offer with tenure to two incoming faculty members. The Physical Sciences and Engineering Library in the Lederle Graduate Research Center will close for renovations during the month of August. Improvements slated for the library include a new lobby, fresh paint, new carpeting and furnishings, and alterations to allow public access to the elevator. In the summer of 1985, preparations were underway for the debut of a new campus newspaper for UMass Amherst faculty and staff. Founding editor Michael E.C. Gery, assistant editor Bill Parent, office manager Laura Kehoe — all alumni — worked with staff from Photo Services and the Publications Office to design the new tabloid, which replaced the 72-year-old Weekly Bulletin, an 8½ by 11-inch compendium of notices and official announcements. Since 1985, many people on and off campus helped the Chronicle in many ways. Some consistently used the paper to communicate news, while others provided us with material, administrative or moral support. Others came to our defense when the Chronicle was criticized or targeted for elimination. Thank you, one and all. © 2003 University of Massachusetts. This page is maintained by the Division of Communications & Marketing.